Recently, we partnered up for a monthly spot in The Outdoor Gazette which is focused on “stories from your neck of the woods.” Hunting, trapping, and fishing are among the various topics covered and Vermont, New Hampshire, Maine are some of the locations that are represented. This was a magazine found on newsstands everywhere but has gone paperless and now can only be found online. Appropriately, we will be focusing our section on fishing stories and techniques in the great state of Vermont. Check out and like their facebook page as well! Our first article was published in the December issue titled “Tournament Fishing Vermont – Small State, Big Competition” on page 35. Take a minute to check it out as well as all of the other great articles for your enjoyment! Our plan is to try to incorporate different modes of fishing through the year showing what helps us be successful for whatever species we are after. Currently we are plotting out some of our potential topics. 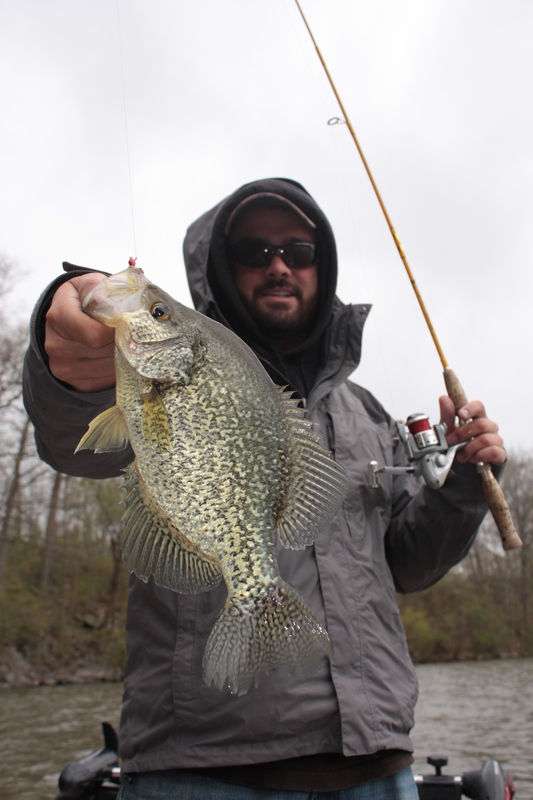 We have schemed up these topics for this ice fishing season: sight fishing bluegill, tip-up/jigging lakers, chasing deep water roaming perch, and big baits for big crappie. If you have any topics you would like to see covered contact us and we will see what we can do. For our needs, we requested the 6 pound test in orange. Neither of us had ever fished with an orange line with red being the closest. We were interested to see how it compared to the usual clear lines we fish. 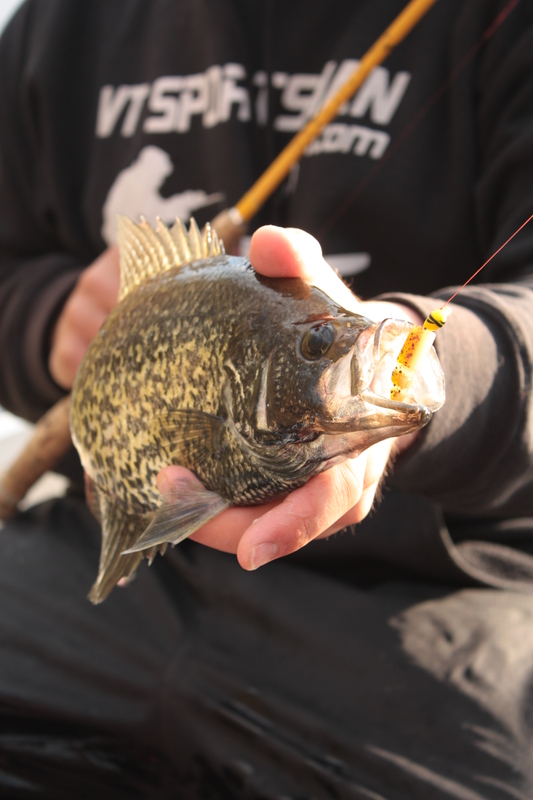 With panfish being our main target, 6 pound line might be considered overkill to many but at times we get off of our panfish kick and chase walleye and bass so being versatile is necessary. 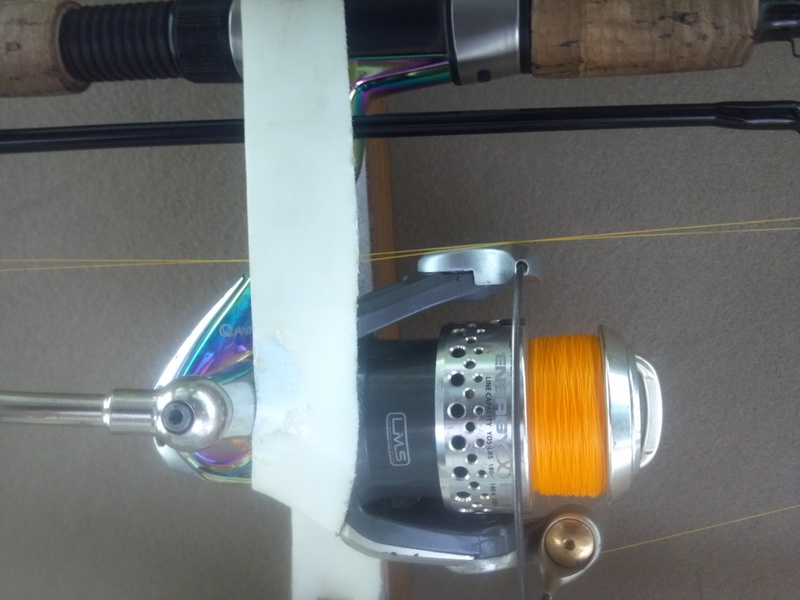 Line diameter is an important dimension to what fishing line we select. Many of the jigs we fish have very small eyes and at times the line can not be threaded through. The line diameter of the 6 lb. line is 0.010″ (0.26mm). The other two options are as follows: 8 lb. – 0.11″ (0.29mm) and 10 lb. – 0.012″ (0.32mm). It is on par with many competitors products. Detecting bites for many is done visually so having a line has good contrast against many different water coloration is important. The line was tested on several bodies of water as well as some streams. The line stood out best on some of the tannin diluted inland ponds and high elevation streams that we fish for bass and native brook trout. 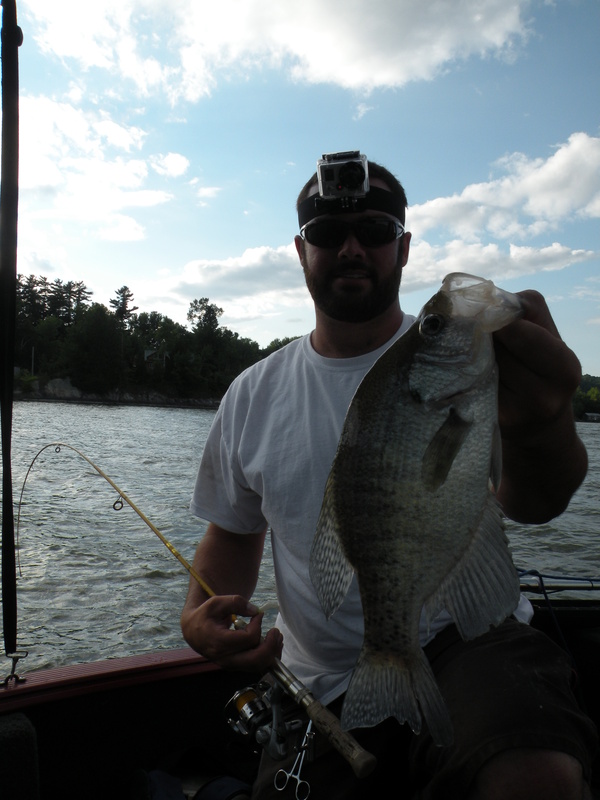 While fishing Southern Lake Champlain, the line proved to be highly visible against the stained waters that are frequent. The only time this line was hard to see was on the Connecticut River when pollen was pooling up as the colors are very similar. Being able to see a small tick in the line makes the orange color very useful in a variety of conditions. 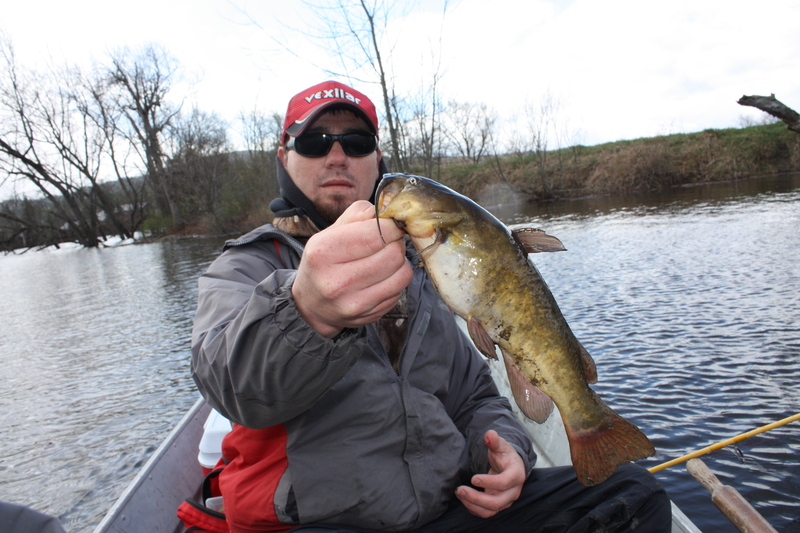 Using this line, we have landed some toothy critters as well as some heavy fish. 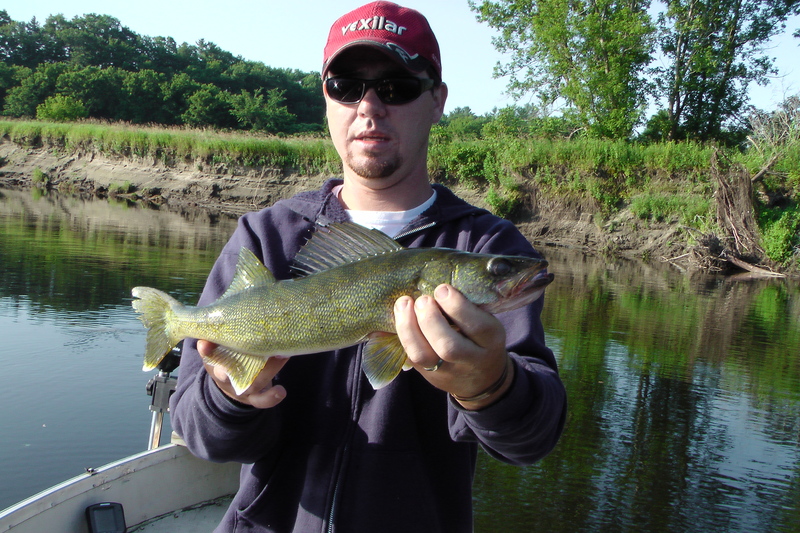 When you look at the teeth on pickerel and walleye, you would think that they would slice right through any line that isn’t braid. 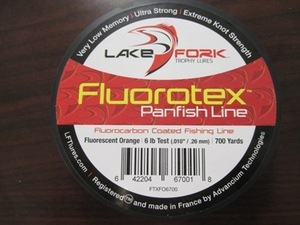 The ability of the line to function properly and resiliently even under the highly stressed areas near the terminal tackle makes it a great option for any angler who wishes to stay light and avoid braid. Check out some of the videos we have put together using this line (as well as the “Live” Baby Shad) to see how well it has served us. 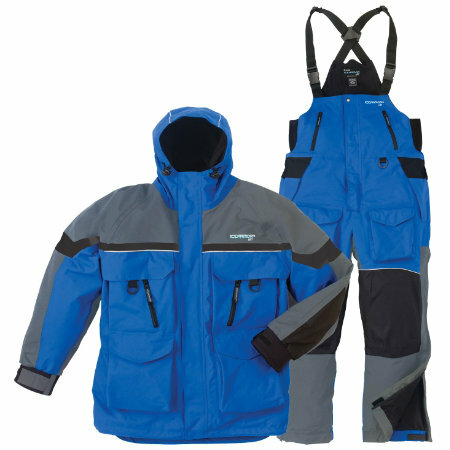 If you want a line that is highly visible, limp, and durable. Don’t take our word for it, give some Fluototex a shot! 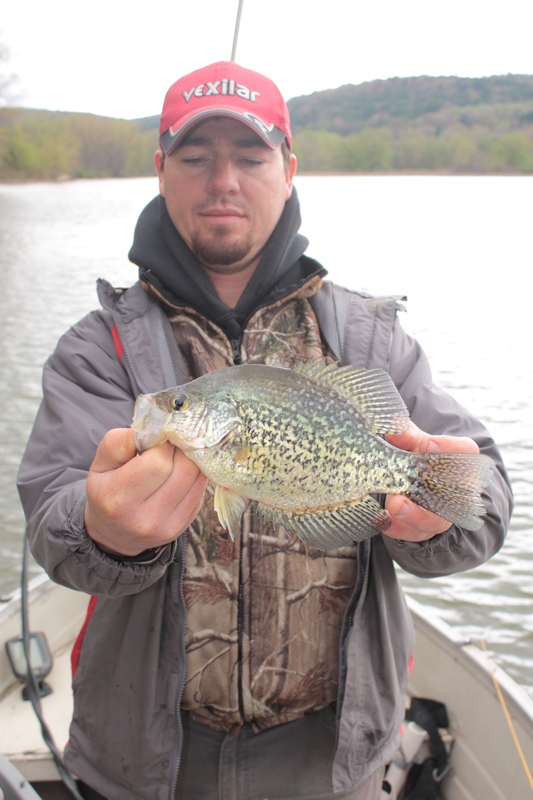 Artificial baits have come a long way in recent years, especially when it comes to baits designed to catch panfish. Many companies are producing baits with new designs and technologies, these baits have become an essential part of our fishing arsenal for both hard and soft water. 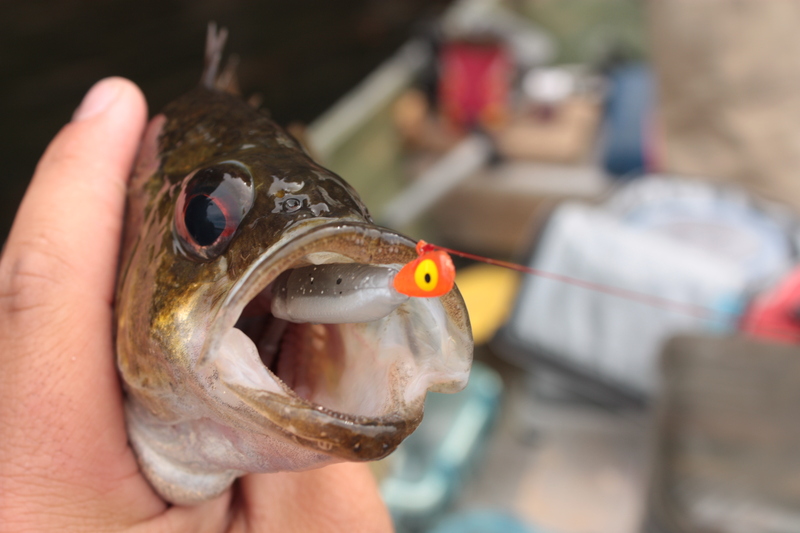 There are many benefits to using plastics over live bait including: cost, durability, castability, and re-rigging time after a bite or hookup. Don’t get me wrong, live bait will still have times when it will out fish plastics but in general I will always choose plastics. 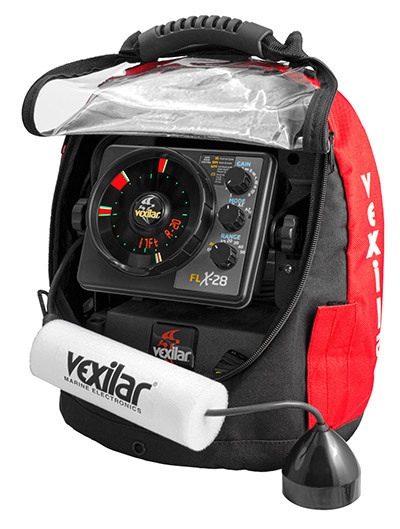 The market for plastics has numerous options that can make one feel overwhelmed but here is a review on one company that has provided us with with some great success recently. 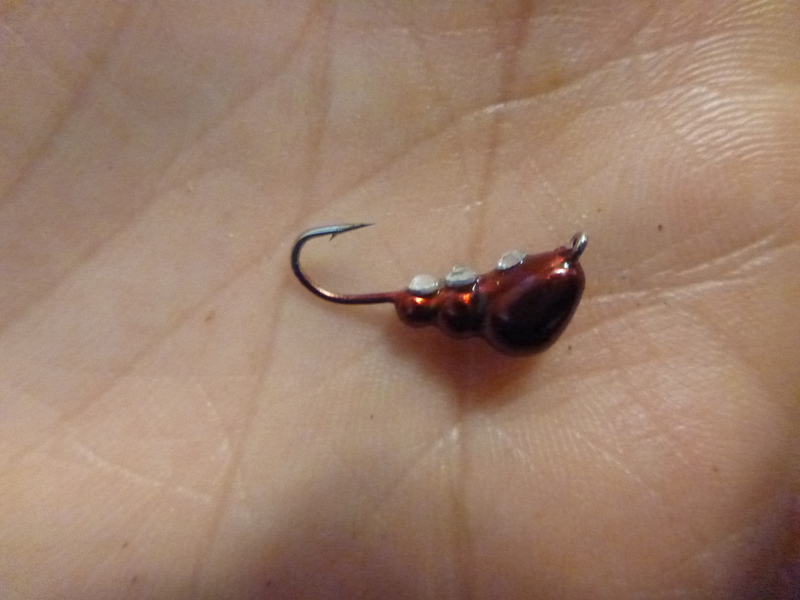 The bait this review will be focused on is the “Live” Baby Shad by Lake Fork Trophy Lures. It is a patent-pending design, 2 1/4″ swim bait, that provides a fisherman with ample action from its combination of “swim slots” and a pintail to entice all types of gamefish”, not just crappie like we usually target. 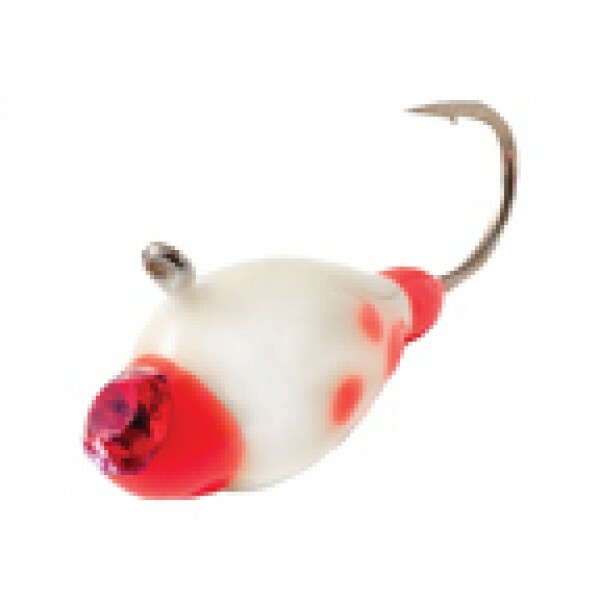 This bait was spawned after requests from many of their customers to slim down their popular “Live” Magic Shad. 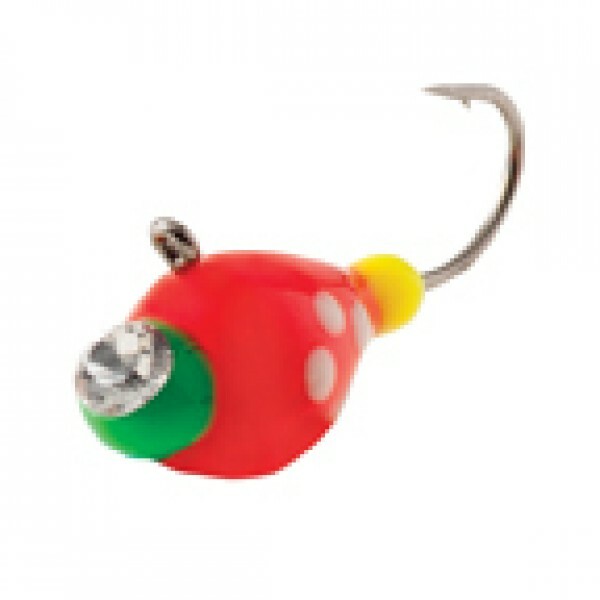 The bait currently comes in 35 different colors to meet just about any of your fishing needs. 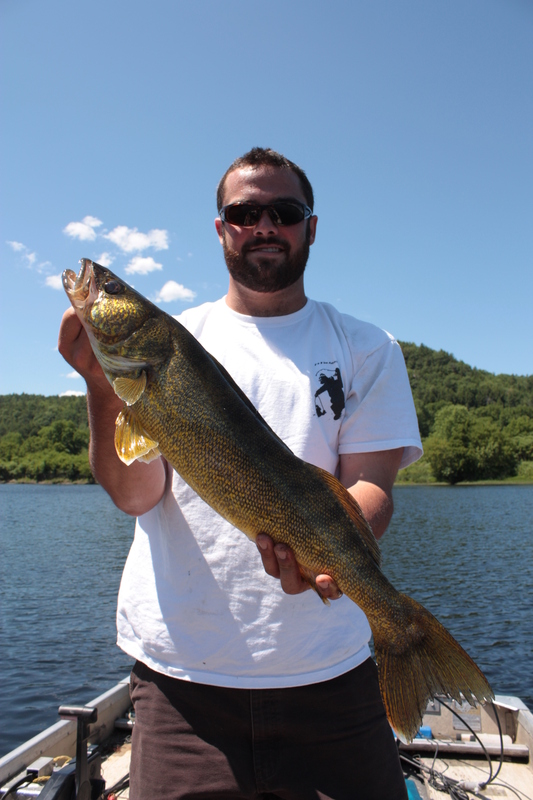 The normal set up we fish for pan fish with is an ice fishing jig under a bobber with a length determined by water depth and the active zone for the desired fish species. 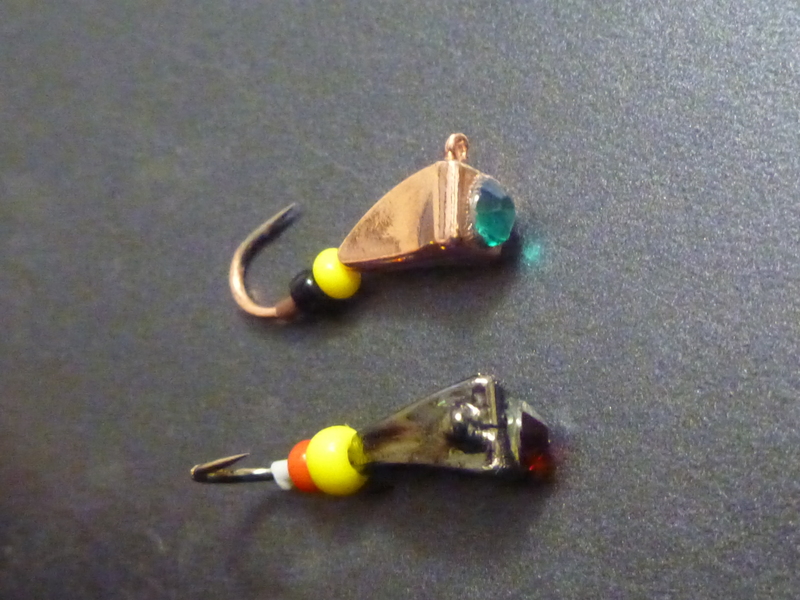 The variety of jig we use depends on where we are fishing but a long hook shank with a wide gap is the best option. There is a lead ban on the Connecticut River, so our main choices are limited to tungsten or to meet the 1″ minimum jig length for all lead products. In general, when fishing tungsten, we run jigs made by Bentley which usually have short hook shanks and a narrow hook gap. 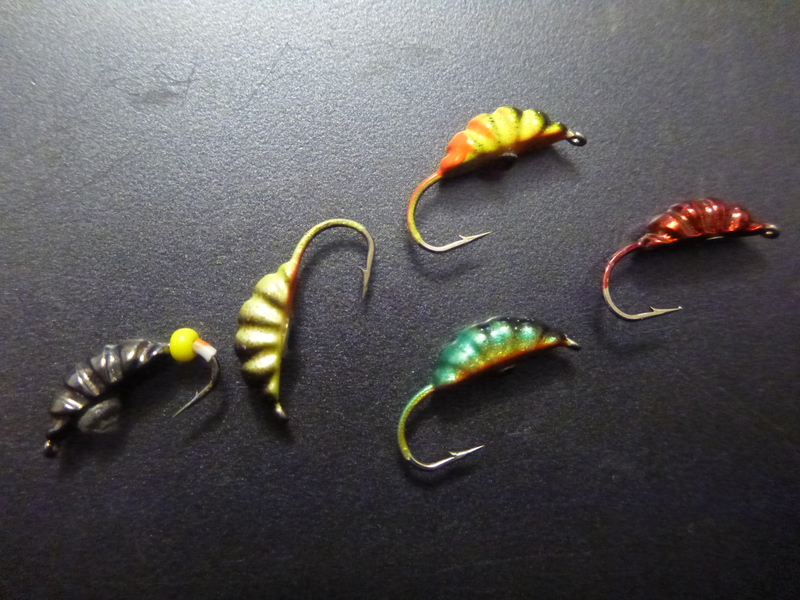 Fishing anything but micro plastics with these hooks can be difficult at times but I still have very good hook up ratios unless targeting bluegill and pumpkinseed. The next best option is to go to just about any sporting goods store and buy lead heads. They come in a variety of sizes but 1/16 of an ounce is our hook of choice and is very common to be 1′ or greater in length. We know that there are other options for jig head composition but when fishing structure and brush we burn through quite a bit of terminal tackle… Lead is just the best option for the price! At first, looking into purchasing plastics seems expensive. You can buy a 15 pack of “Live” Baby Shad for $2.99. When you count the number of fish that can be caught on one single piece the number of fish possible per bag can grow very quickly making the price seem far more reasonable. When you look at it this way, cost and durability go hand in hand. Unless you are catching toothy critters or having fish that are just biting the tail, it is hard to ever notice a bait getting beat up. 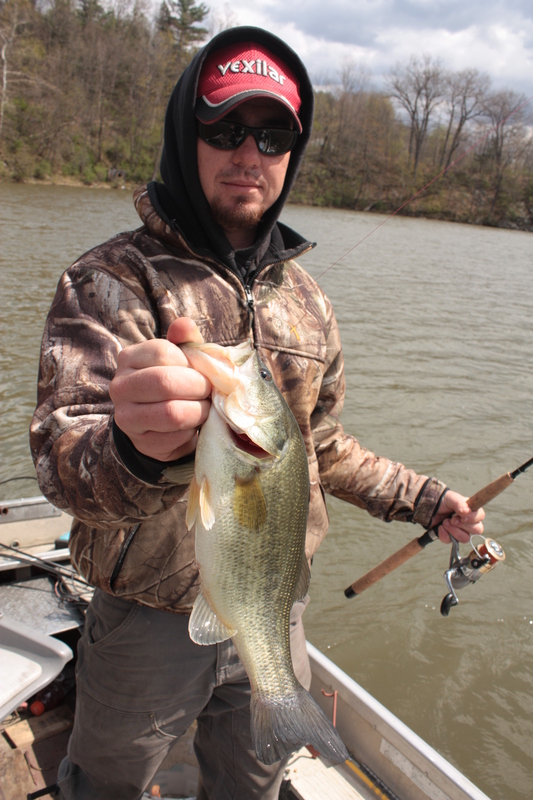 Catching 50-60 fish per bait or more is not out of the question. For instance, check out the two pictures below. 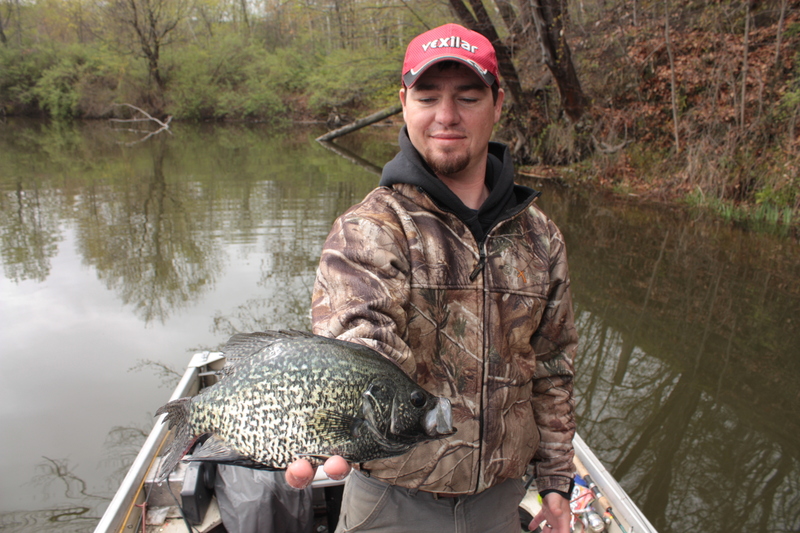 Fishing for crappie, we find that the majority of the time the bait is inhaled so far that the bait isn’t even touched and is stuck in the roof of their mouth. That means no tearing of the bait and the tail is left untouched. 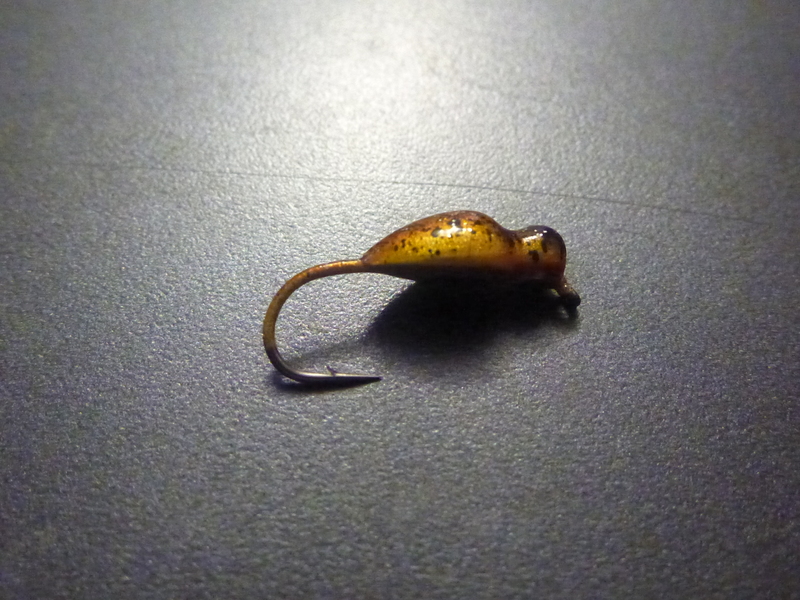 Most issues that evolved with this bait, as with any swim bait, is tearing around the head of the bait where it was stuck initially with the hook. When this happens, depending on the severity, I just bite off as small of a section to get rid of the tear in order to halt its progression further. Another benefit to fishing plastics is their ability to cast out with very little concern about the bait falling off. I can’t tell you how many times I’ve fished live bait and been limited with what is in my range for a cast because I can’t whip my bait. For all the times I’ve fished plastics, I have never whipped it so hard that my bait flew off other than when due to a faulty knot. 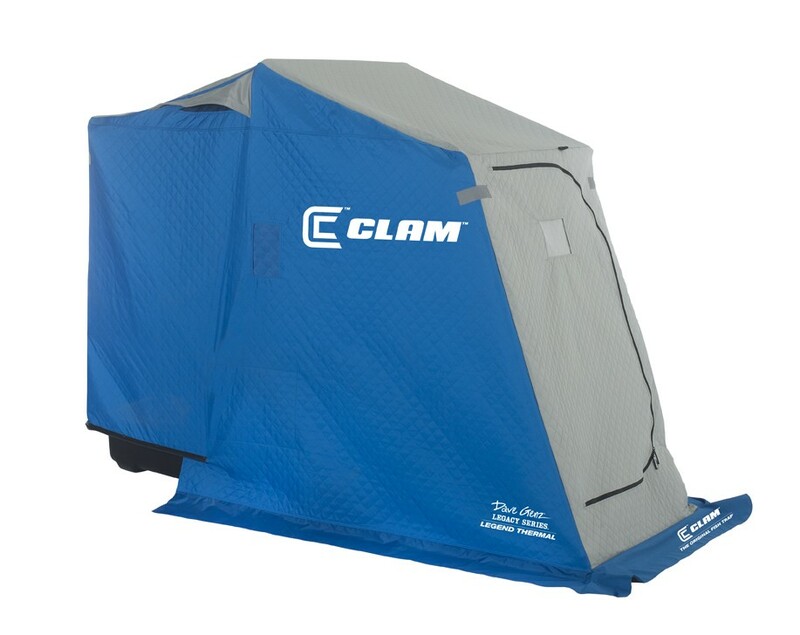 Now lets think about times when fishing live bait. 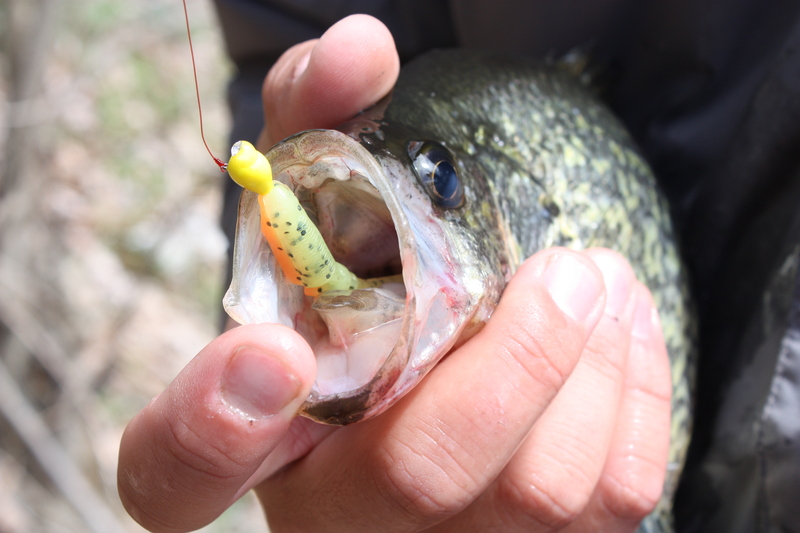 Most bites result in stolen bait or a hook up. When you reel it in, chances are you will have to re-bait. This means getting into the live well, scooping out a minnow and hooking it while its flopping. 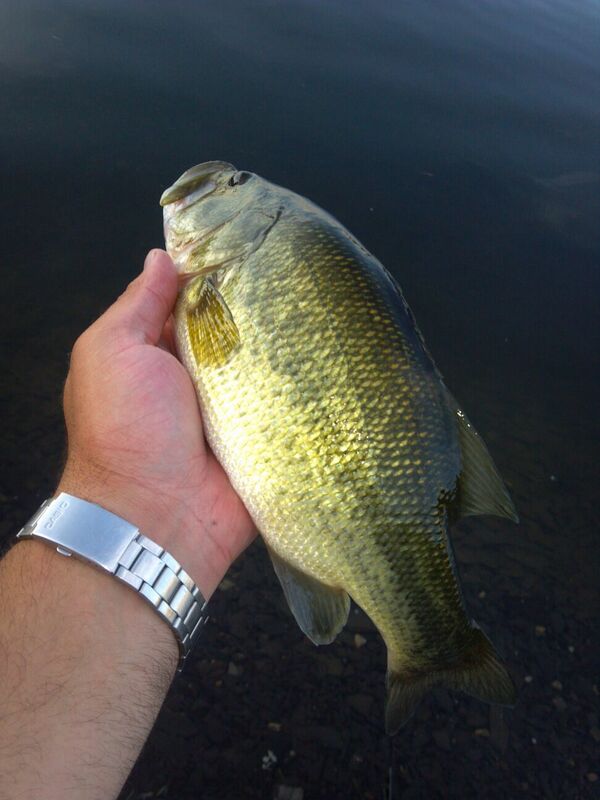 With plastics its a matter of pushing the bait back up onto the bait holder and you are back in the water. If it is time to put a new plastic on, you don’t have to mess around with anything but a bag and they won’t die on you! The action these baits by Lake Fork Trophy Lures have is amazing. 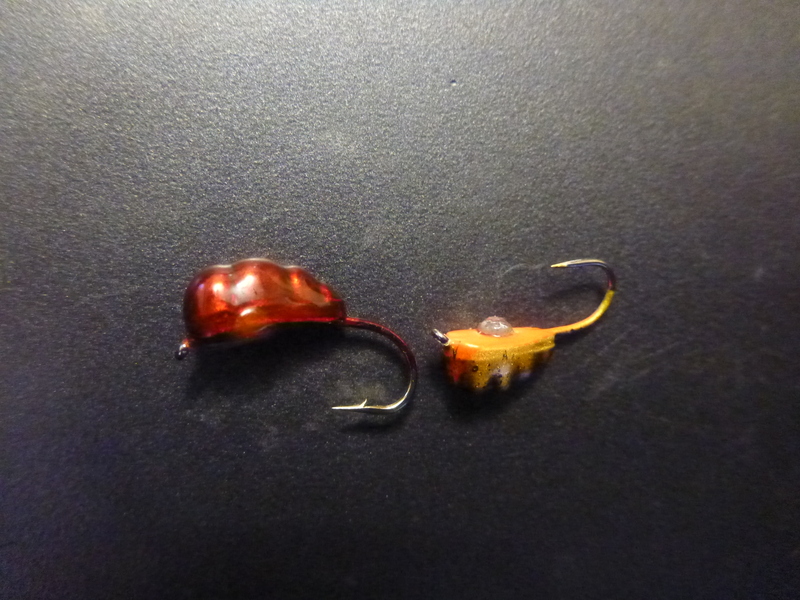 The swim slots allow more side to side and vertical action than other similar styled “shad baits” because of their ability to twist more freely. When coupled with the pin tail and ball at the end, it makes twitching your bait even more effective because of the bit of added weight. Being that the sliver of plastic between the sections in the body of the bait are so thin, you would think that it is a weak spot. This is not true. We found no issues with the segmented body. There was only two places that the bait that ever ripped. The head of the bait around the hook shank as we mentioned before and only a few tails were bit off. During the period in which we fished this bait exclusively, the fish were very lethargic so a quick retrieve was most productive. 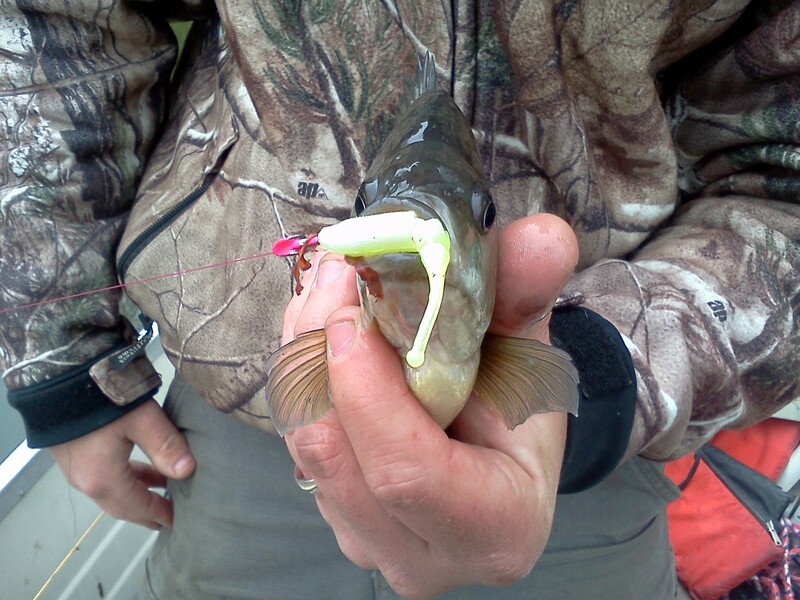 This swimming action of the Lake Fork Lure only added to the triggering effect of the retrieve. 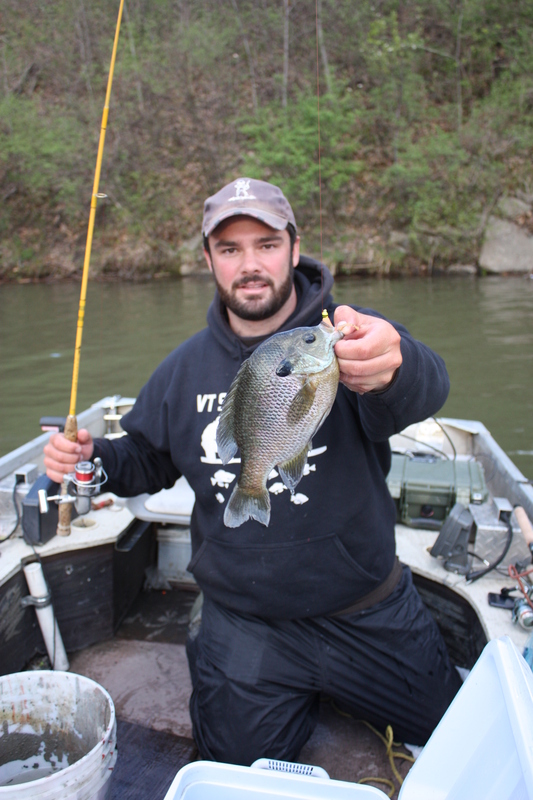 One of our favorite fish to catch is the bluegill. 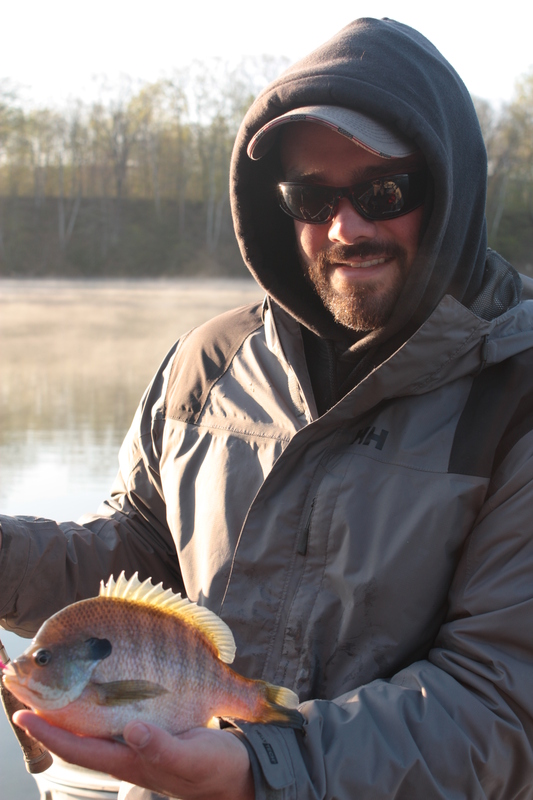 I’m sure that anyone reading this has caught or at least seen a bluegill up close and the size of their mouth. The area where the majority of this baits testing was done was loaded with giant gills so as our baits were being stolen it wasn’t too hard to figure out who the robber was. 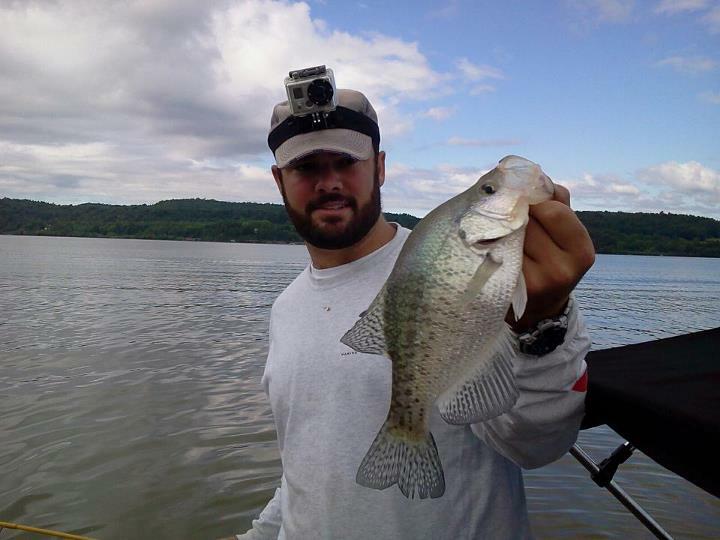 The difference between a feeding gill and crappie is only a matter of their ability to fit the entire bait in their mouth as they are both very aggressive. 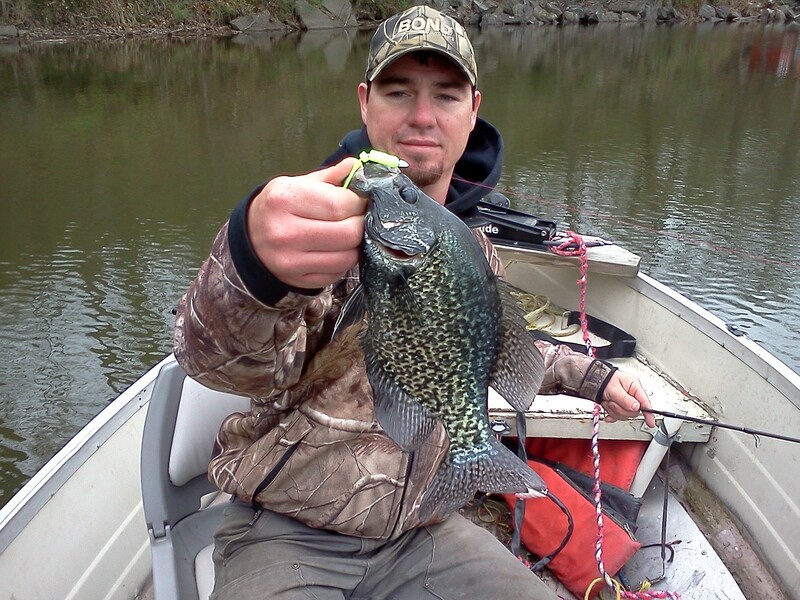 The main drawback for us with the “Live” Baby Shad was the number of baits lost due to bluegills. When the fish were feeding aggressively, the size of the bait was no issue and the fish would steal far less plastics. When the bite was slightly negative, I found that the baits were being ripped off because the fish were grabbing just the tail. I have watched this over and over during the winter months on my underwater camera when the fish are only sucking on the baits. When I have a situation arising like this, I try to come up with a way to counteract the downfall. The solution to this was to bite off a section of the head before threading it on the hook. Also, I found some success in waiting a bit longer before setting the hook to allow time for the fish to actually take the bait. At times, a quick reaction is necessary though to get the hook setbefore the fish spits the bait realizing it isn’t actual forage.